If you want to avoid the swimming and rappelling of the Subway "top-down" route but you still want to see some of the beauty of the Subway, you can hike up the Left Fork from the "bottom." Starting and ending at the Left Fork Trailhead (roughly 8.2 miles up the Kolob Terrace Road from the town of Virgin), this route is a completely non-technical hike up the Left Fork of North Creek to the Subway section (almost 3.3 miles one way), allowing hikers to see many of the canyon's beautiful cascades and waterfalls as well as the famous lower Subway formations. The complete hike may take anywhere between 5 to 9 hours and is a full day in some beautiful remote scenery. 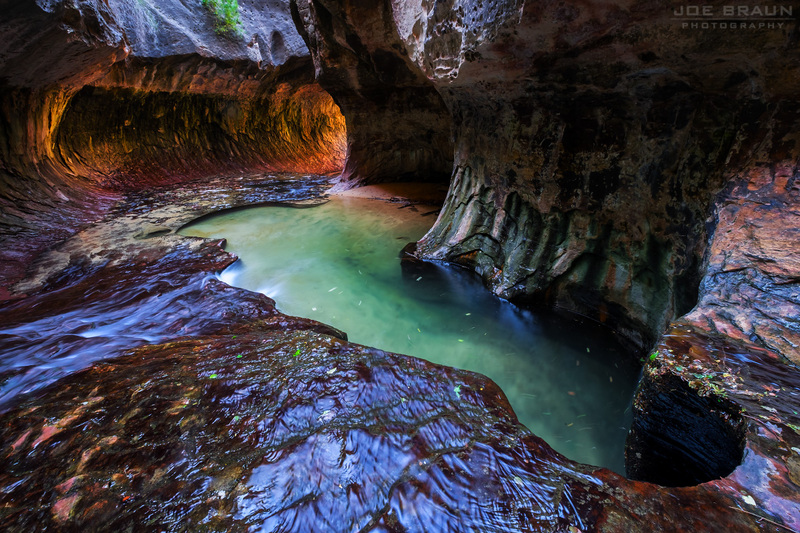 A Zion wilderness permit is required for all hikes through the Left Fork/Subway ("bottom up" and "top down"). This canyon has gained epic popularity and the National Park Service has an advanced lottery and last-minute lottery system in place to allocate permits to 80 people a day. For more information on permit reservations, please see the Zion Permits website. 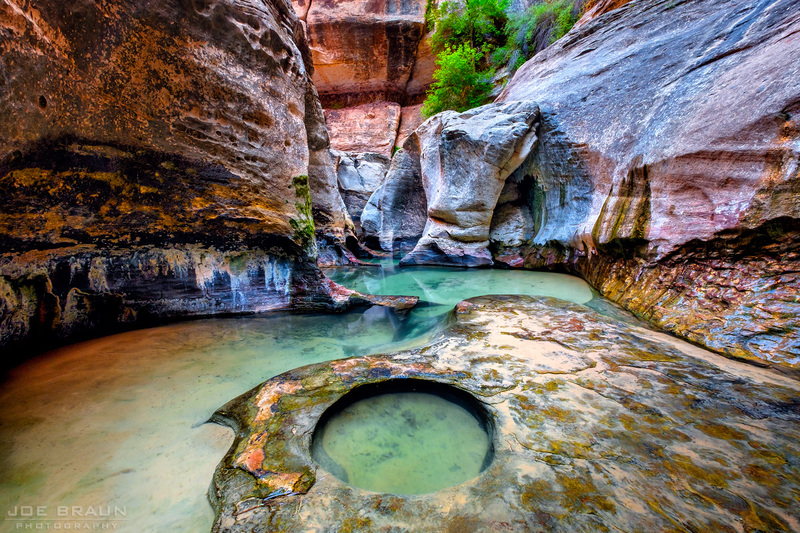 This is a strenuous hike through some rugged terrain, including descending a steep and loose slope, hiking through an obstacle-filled river, and navigating sections of very slippery and wet rock formations. Allow plenty of time to do this hike and be prepared to get wet. This hike doesn't require any canyoneering gear, but it is still a serious adventure. Rating: Strenuous day hike in a wet canyon with many obstacles. Elevation Change: 400-ft descent from trailhead to bottom of canyon, then gradual 600-ft elevation gain up the canyon. Seasons: Spring through fall are most likely, although spring runoff in April may make hiking more difficult. The route is possible in winter with adequate cold water protection. Permit Required? 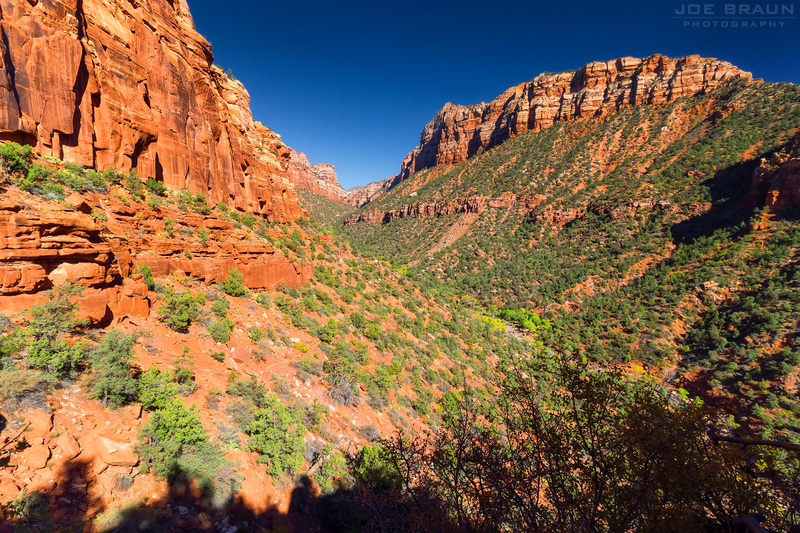 YES, a Zion wilderness permit is required for ALL hikes through the Left Fork/Subway. Flash Flood Warning: Do not do this canyon if there is a threat of rain. The Left Fork Trailhead is actually several hundred feet above the Left Fork of North Creek. From the parking lot, follow the mostly level well-maintained trail as it heads northeast for roughly half a mile. Soon enough, you will reach the cliffs overlooking the Left Fork; continue along the trail as it makes a fairly steep descent, zigzagging down roughly 400 feet to reach the streambed of the Left Fork. While this section has a lot of loose rock and sand and may be intimidating to some, it isn't very treacherous. Now it's time to hike up the canyon! You will alternate between following sections of trails of use along the banks, boulder-hopping, and hiking right in the stream course. Since 2011, the National Park Service has done a good job of constructing obvious trails of use along the banks to make life easier for hikers. (If you see old trails of use that are blocked by logs and sticks or "do not hike here" signs, please avoid them and allow them to return to nature. 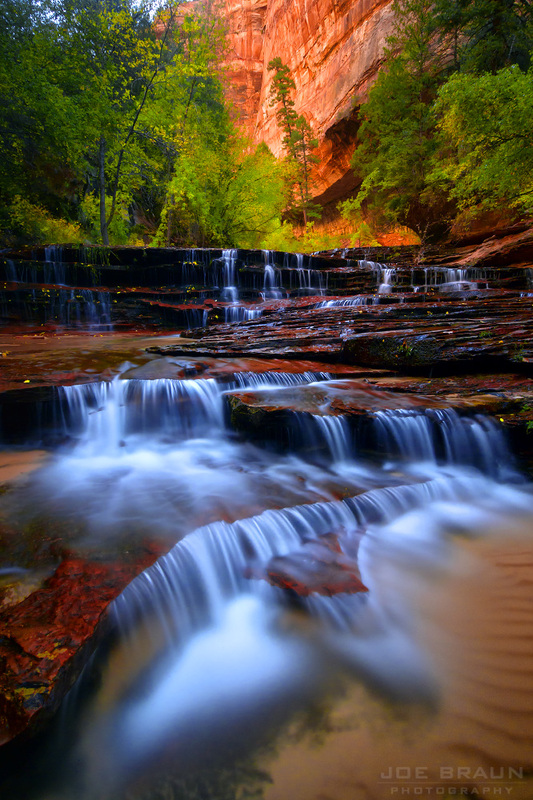 Many old trails of use were of questionable value and only serve to erode the canyon.) Early in the hike, the trails of use are quite prevalant, but eventually you will have to do some significant hiking in the stream itself. Do not waste energy trying to avoid this; everybody gets their feet and legs wet on this hike. After roughly two miles of hiking, the not-so-interesting scenery starts to turn beautiful as the canyon becomes less obstructed and more solid slickrock appears at the bottom of the stream. You will pass several cascades and then two roughly 15-foot tall waterfalls that are the favorite subjects of many photographers. Both waterfalls can be bypassed by hiking around on the right/south side of the canyon. These cascades and waterfalls feel like a grand staircase leading up to a sacred temple, but take great care as the rock here is incredibly slippery. Upstream from the second waterfall, look for the narrow "train track" crack that most of the water flows through. When you have had your fill, it's time to retrace your steps and hike back out! The hike out should seem a bit easier, but allow plenty of time and remember to keep an eye out for the exit spot! (A GPS is very useful to keep track of your progress and to make sure that you didn't miss the exit or attempt to exit too early up Lee Valey!) The steep 400-foot ascent back up to the Left Fork Trailhead can be quite grueling after a long day of hiking, but it will be over soon enough. Left Fork Trailhead to The Subway. Allow plenty of time to do this hike and keep track of time! It takes a full day of hiking to see the Subway. If you start late and hike slowly, you will have to turn around before seeing the highlight of the canyon. Do not lose track of time and get caught in the Left Fork after dark. The hiking season for the Subway is typically late spring through autumn, but conditions are much more difficult during the spring runoff which usually takes place during April and May. This hike is accessible in winter, but cold water and unpredictable conditions make this a more serious undertaking. If you have any concerns about conditions, please ask the rangers at the Wilderness Desk to get the latest information. While the scenery of the top-down route is much more spectacular, the Subway "from the bottom" route allows hikers to see at least some of the beautiful rock formations of the slot section. The lower part of this canyon isn't the most stunning, but it is still a great place to hike.